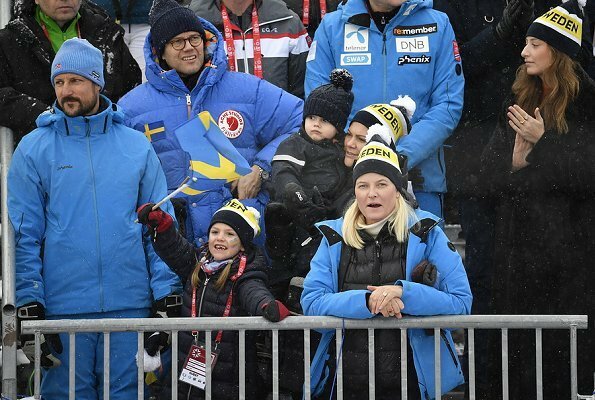 On February 08, 2019, Swedish Crown Princess Victoria and her family, Prince Daniel, Princess Estelle and Prince Oscar, Norwegian Crown Prince Haakon and his wife Crown Princess Mette-Marit attended FIS Alpine World Ski Championships 2019 taking place in Åre city of Sweden. 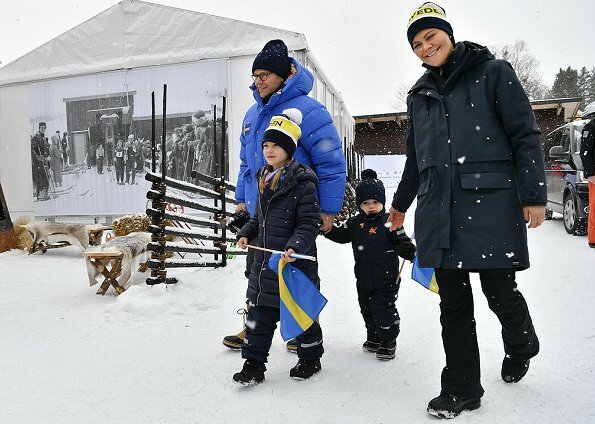 The Crown families will be present at the championships until February 10, Sunday. The event which started with an opening ceremony on February 4 will be end on February 17, Sunday. 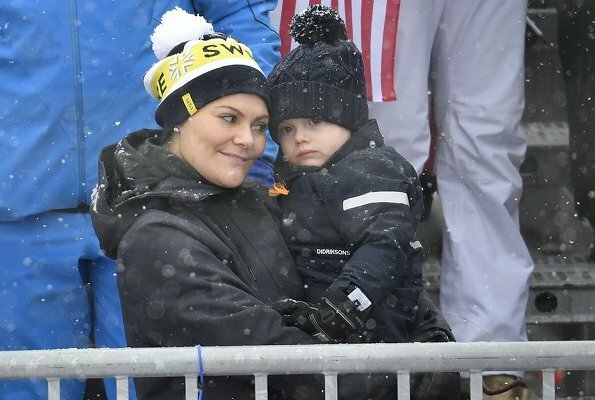 Why should she not go skiing? Her lung disease is not making her bed-ridden, and I do think that some fresh air might be not a bad thing for her. She's under treatment and seems to do quite well. 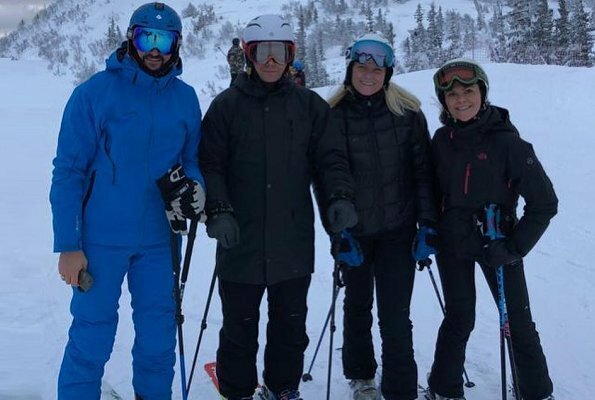 She's a bit holidaying with her family and friends, and a few turns on skis might not do any damage. I'm very glad to see her out and about. Good grief. Be happy to see her out. Actually many people who suffer from IPF find 'fresh air' agonising particularly in winter and can't participate in winter sports even if they used to love to. So I would not make assumptions about anyone making remarks here without knowing more - they might be a sufferer. I had a relative die of this and it is a nightmare. (He was once a keen skier.) 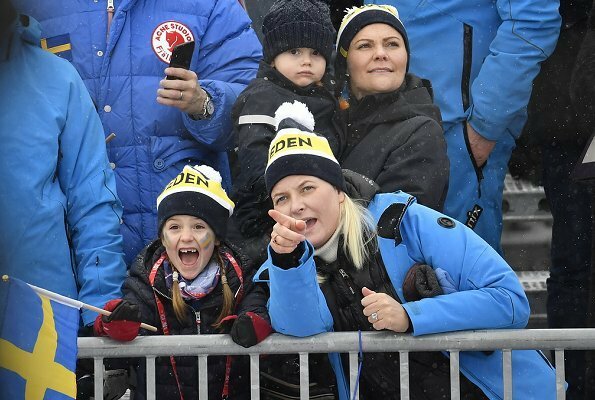 It is lovely Mette-Marit is well enough to participate. 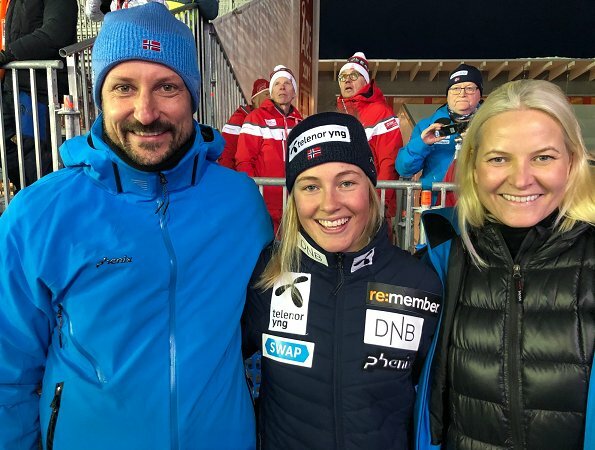 Isa, you must be the Crown Princesse's personal physician and she is there, skiing, against your orders! Then you should call her and save your breath at this site. There are two of us with the same name! This one does not speak French and certainly wouldn't assume to give medical advice to anyone! 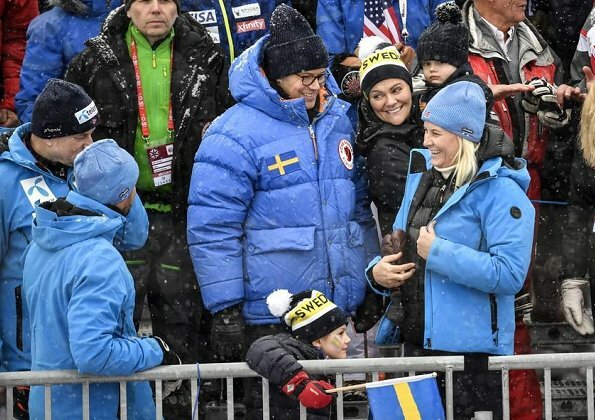 Wonder what language they speak with each other or is Norweign and Swedish close enough to understand each other. I see Mette-Merit speaking to Estelle that is what made we wonder. As Estelle is probably not completely fluent in another language. Swedish and Norwegian are languages near enough so they can understand each others speaking just their own languages. Thank you everyone for your replies to my post. Back to grumpy faced Oscar. He's lovely when smiling but even more cute when he's not! Great to see these two lovely couples having fun together. Yes, i like him also when he is not smiling. He is sooo cute! Hahaha grumpy but so cute one isn't he? 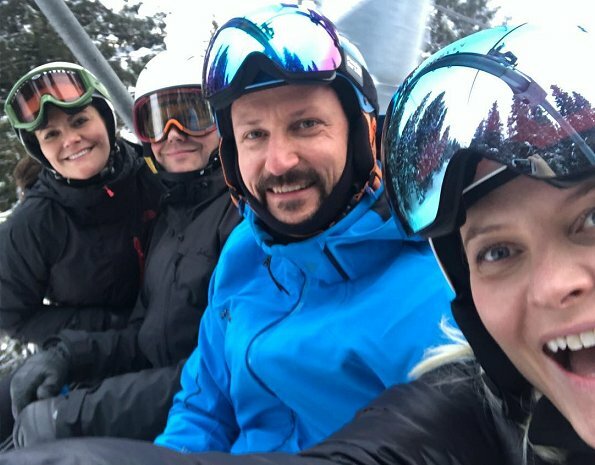 So happy to see Mette-Marit enjoying her time, and fellow french speaker aboie what an inconsiderate post, are you a physician? Nice to see them all having fun together. I love seeing these two families out and about together. Love seeing those friends out having fun. They all look so happy. Perhaps a sufferer or someone with someone in their family who suffers from this nightmarish condition. See my comment above - my cousin who adored skiing died of this disorder - he couldn't even go with his family on ski holidays. It may be a doctor's decision but more to do with what the person can tolerate. There is a young woman from Canada who blogs on being young with IPF - she speaks of having to have the heat in the car already running before she can step outdoors and prioritising errands since she can only tolerate one in winter. 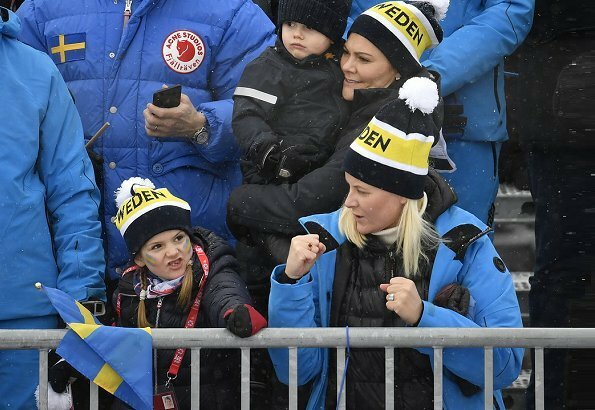 It's lovely Mette-Marit can sit out in the cold - it's also very unusual for a person with IPF. You might read and learn before commenting. 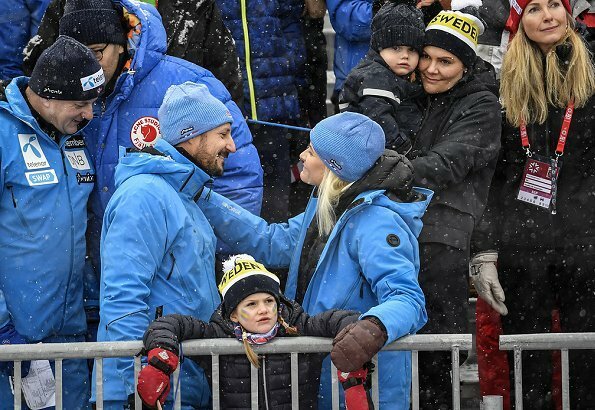 Hopefully Mette-Marit is not so sick as people think and she can enjoy the skiing. Thank you Julia for the information. I am not that familiar with IPF. Sounds like it is unusual for a person with this to be out in the cold so much. It is nice to see these two families enjoying each other's company. This event is well represented, by both RF.Oscar I think can take it or leave it, not a smiling occasion. Happy to see CP MM looking well and enjoying herself. Also nice ski outfits.